National Park. The crag starts from the stream at about 740 metres altitude and tops out on Hoophorn Spur at 1000 metres. It faces north and catches the sun. Most of the routes are bolted, but take natural gear for additional anchors and placements on some routes. There have been some fixed ropes left in place, use at your own peril. There is plenty of scope for more routes, both natural and bolted. Note that this area is a domestic water catchment area and must not be polluted. the bush and follow the track up to the remains of the old pipe-line bridge. Cross the stream, onto the true right, by using the rocks down-stream from the bridge. Climb "Pipeline Rib" to the left of the bridge. Above the rock rib, ascend the grass slopes to the crag. There is also a steep access route directly above the end of the bridge, to the top of "Pipeline Rib". If Sawyer Stream is too high to cross safely then access can be made by crossing the stream near the gravel pit and ascending Hoophorn Spur via the grass slopes. You can then abseil down the crag with double ropes from the chain anchors on top of "Jogger's Special". DO NOT ATTEMPT THE GRASS SLOPES WHEN WET! BE PREPARED TO FIND YOUR OWN ANCHORS AND GEAR PLACEMENTS. CLIMB AT YOUR OWN RISK. Access route that follows the rib above the old pipeline bridge to the beech trees. 2 pitches on natural gear. Not a beginner lead! 1st pitch starts from the ledge above the stream and steps left onto the rib. Continue up the rib to the trees to belay. 2nd pitch heads up the corner to the left, through the trees. Belay from the trees at top. Follow extreme left line on the crag with natural gear. Continue up the arete above "Don't Forget the Kids", to the very top of the crag, with natural gear. Be careful with the loose scree at the top. Descent can be made by double-rope abseil from the top of "Jogger's Special". Otherwise take your walking shoes and walk off the back, past the tarn, over the fence and down the steep grass slopes towards Unwin Lodge. Climb through the scoop in the obvious overhang and follow right-most line on slab above. Bolted. 2 bolt anchor at the top. Follow line of spaced bolts up three slabs separated by small overhangs. Bolted. Chain anchor at the top. Beware of loose scree over the top. Long ropes required. Shares belay at its base with "Bone China". The bolted left line up the slab. 2 bolt anchor at the top. The bolted right-hand line from the belay, following breaks up the slab. Trend right after second bolt. Chain anchor at the top. Shark Walk (16/17) 50m The slab up the extreme right-hand end of the crag. Natural gear. 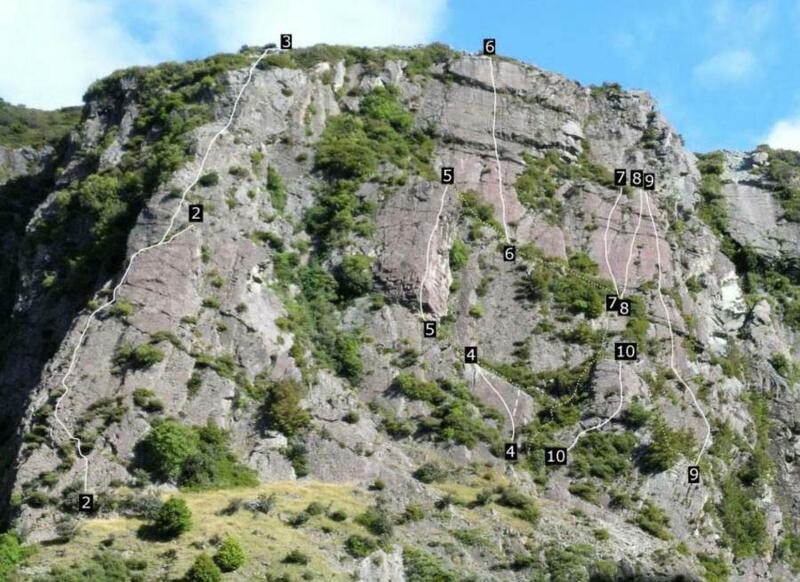 The 1st pitch is accessible by abseil from base of "Bone China". 1st pitch to get back to the level of "Bone China" start. 2nd pitch either head straight up cracks or use them to protect the arete on the right. Shares top anchor with "Bone China". Trad route that steps right, past a small cave, and then up the buttress.